Today is a big day with the release of Windows Server 2012 R2 Update! Windows Server 2012 R2 Update is a cumulative update of every hotfix released for Win2012 R2 to date. This just radically simplified our set of recommended hotfixes. 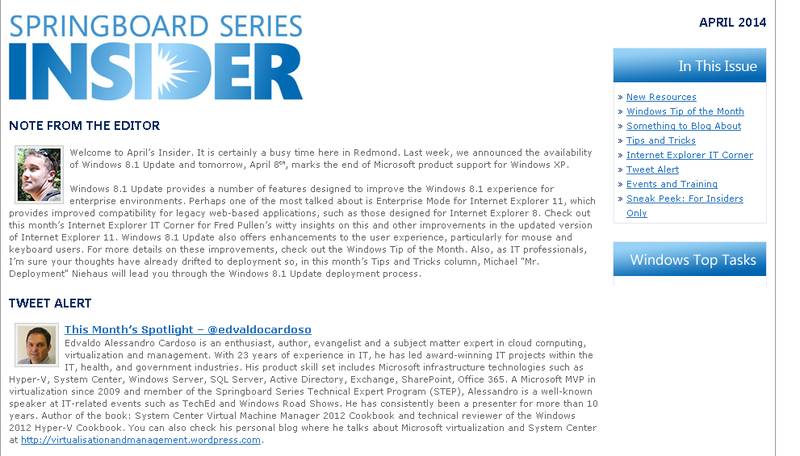 Microsoft Windows releases a monthly newsletter called Springboard Series Insider. This is a vastly popular online publication targeting IT Pros and anyone interested in Windows. Only a few are listed in the Springboard Series Insider. So I am really happy and proud for this recognition. Thank you! This month the main theme is Windows 8.1 updates, which provides a number of features designed to improve the Windows 8.1 experience for enterprise environments. Note: As always, if you have any suggestions on content you’d like to see or resources you need, please reach out to Microsoft anytime at springboard@microsoft.com. In the meantime, enjoy this month’s edition of the Springboard Series Insider and be sure to try out Windows 8.1 Update!